A 5-year-old boy with Down Syndrome presented with a history of intermittent episodes of eye rolling upwards or staring for few seconds with no postictal state. 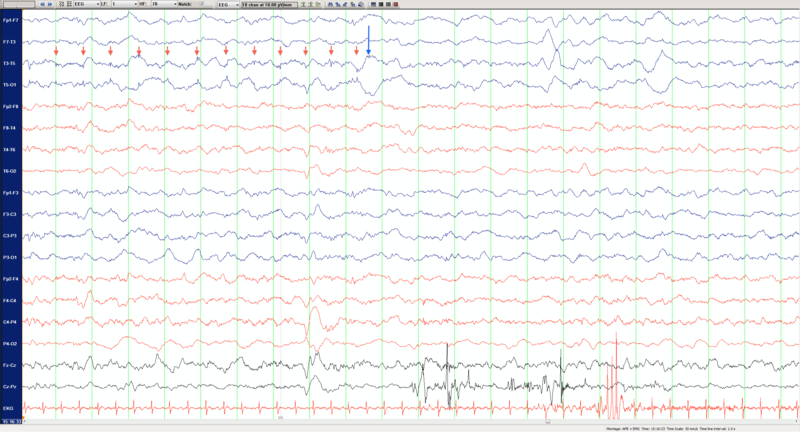 A routine outpatient EEG recording was obtained to assist with the diagnosis. The EEG, performed under sedation with chloral hydrate, revealed normal sleep features with superimposed intermittent periodic discharges in the left temporal head region (Figure 1), which occurred in sustained runs lasting between 30 seconds and 2 minutes. The discharges remained localized to the T5 electrode, maintained a consistent frequency of just over 1 Hz, and did not clearly evolve in frequency, amplitude or morphology. There was no associated focal slowing. Figure 1. 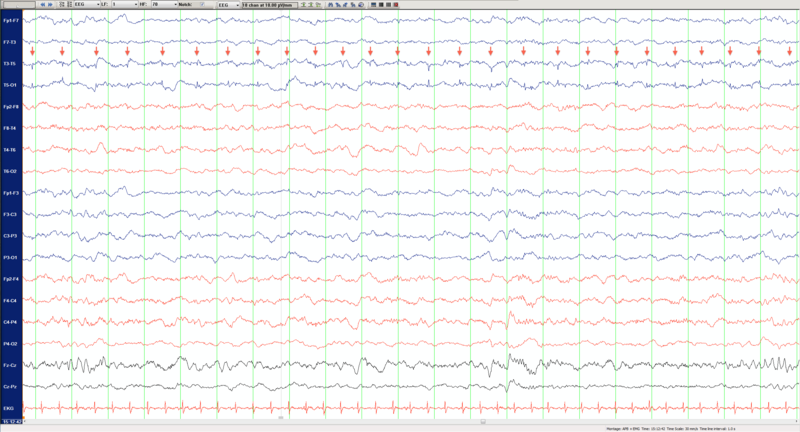 Routine EEG in an A-P longitudinal bipolar montage displayed at 10μV/mm. FCz was used as a reference. The sampling rate was 200 Hz with 1-70 Hz band pass filter. Arrows illustrate periodic discharges phase reversing at T5. What do these periodic discharges represent? Because of the spiky morphology and the regular, periodic nature of the discharges without evolution in frequency, amplitude or morphology, an ECG or pulse artifact was considered, however the discharge frequency did not match the patient’s 120 bpm heart rate. Examination of the time-synchronized video recording revealed that the discharges appeared only when the child placed his head on his mother’s chest and disappeared promptly when the head was repositioned (Figures 2 & 3). Therefore, we concluded that these periodic discharges most likely represented an artifact generated by the mother’s heartbeat. We considered the possibility that these periodic discharges represented either pulse or ECG artifact. The child’s head was wrapped with gauze, an electrical insulator, therefore it would seem more likely that pulsatile chest movement could have been transmitted to the T5 electrode rather than the direct electrical field of the mother’s electrocardiogram. However, the observed discharges had a spiky morphology more typical of ECG artifact than pulse artifact. It is possible that the head bandage was sufficiently loose to expose the T5 electrode, which could have come into direct contact with the mother’s chest covered only by a thin T-shirt, allowing for direct transmission of electrical potentials from the mother’s heart. Figure 2. Prompt disappearance of T5 rhythmic discharges when the child’s head is repositioned off the mother’s chest (blue arrow). Figure 3. Still image from time-locked video depicting position of the child’s head during the time of the periodic left temporal discharges. Ebersole JS and Pedley TA, Current Practice of Clinical Electroencephalography, 3rd Edition, Lippincott Williams and Wilkins.